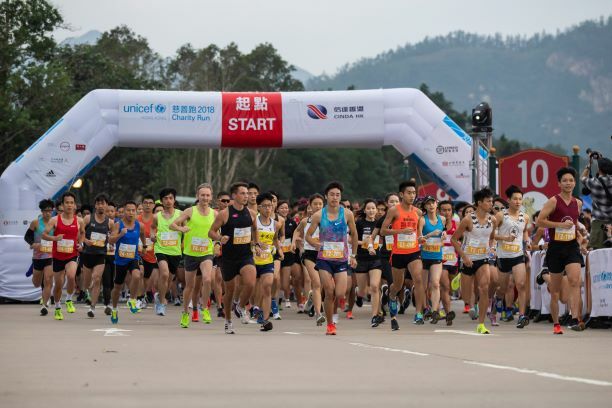 HONG KONG, 25 November 2018 – The 13th UNICEF Charity Run, organized by the Hong Kong Committee for UNICEF (UNICEF HK), successfully concluded today. 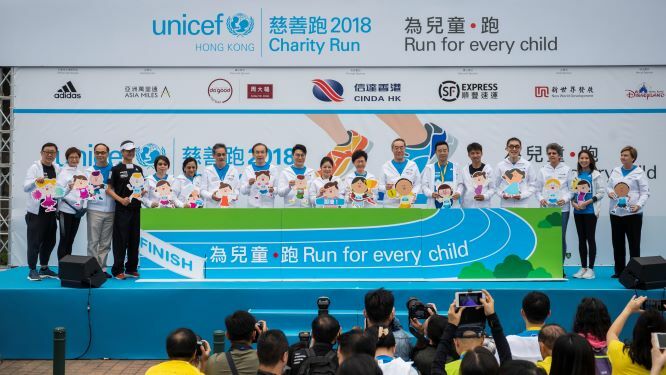 HK$12 million is expected to be raised from more than 13,000 runners in support of UNICEF’s global programme against AIDS, which aims to eliminate mother-to-child transmission of HIV, close the HIV treatment gap, prevent HIV in adolescents and provide counselling and support for mothers and children affected by HIV and AIDS. 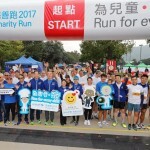 The event, held at Hong Kong Disneyland Resort, attracted a diverse group of participants, such as professional runners, elite althetes, KOLs, business leaders, individual runners, families, and UNICEF HK Ambassador Mr Wong Kam-po. Mrs Carrie Lam, the Chief Executive of the Hong Kong Special Administrative Region, accompanied by Mr Henry Tang, UNICEF HK Honorary Adviser, and Ms Judy Chen, Chairman of UNICEF HK, officiated at the prize presentation ceremony. Mrs Lam commended UNICEF HK’s efforts in organizing UNICEF Charity Run to support the global campaign against AIDS in the past years. She hoped everyone would continue to support UNICEF’s work in building a more child-friendly environment. Meanwhile, Mr Wong remarked that joining the 3 km Family Run with his 3-year-old son has a special meaning to him. “It is important for children to participate in outdoor activities, and the Family Run is beneficial to child development. It promotes bonding between parents and children by having them running together,” Mr Wong said. This year, 10km runners finishing the race within the prescribed time were awarded with finisher medals. Also, runners were allowed to customize their bibs, adding an extra layer of meaning to the event. Besides, environmentally friendly measures were implemented to reduce solid waste. For example, foldable and reusable plastic cups were distributed to each runner and self-service water stations were set up at the finishing points, reducing the use of disposable plastic bottles. A total of 32 corporate teams participated the Half Marathon Corporate Relay and more than 40 business leaders competed in the 3km Leadership Challenge. Besides the business sector, many celebrities and athletes also joined the race, including Aka from Super Girls, a famous Cantopop girl group competed in the 10km Run (Challenge); Mr. Lam Hin-chung, the 2018 Asian Games Fencing Bronze Medalist; Ms. Lam Hin-wai, Lam Hin-chung’s sister and a fencer who participated in the 5km race, and finished in 22:45 and 29:04 respectively; Mr. Ngai Kang, the 2018 Hong Kong Marathon Highest Local Finisher, finished Half Marathon in 1:14:22; Mr. Walter Cheung, a veteran marathon runner and public relations guru; Ms. Mable Lui, the 10km Challenge Women Champion of 2017 Hong Kong Marathon who ran in the Half Marathon. The exciting run was remarkable as runners went all out to run for every child. In the end, Thomas Kiprotich clinched the Men’s Half Marathon Overall Championship in 1:10:09, while Lui Wai Man won the Women’s Half Marathon Overall Championship in 1:25:15. 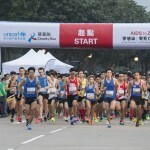 Men’s and Women’s 10km Overall Championships were Wong Kai Lok (0:32:41) and Tong Lok Yu (0:37:39) respectively, Tong Lok Yu also broke the Hong Kong Junior Record (Girls) of the 10km run. Also, Jaybird (1:16:04) was awarded the Corporate Relay Championship, while Michael Chan (0:11:10), CEO of DMC Investments Ltd. won the 3km Leadership Challenge. 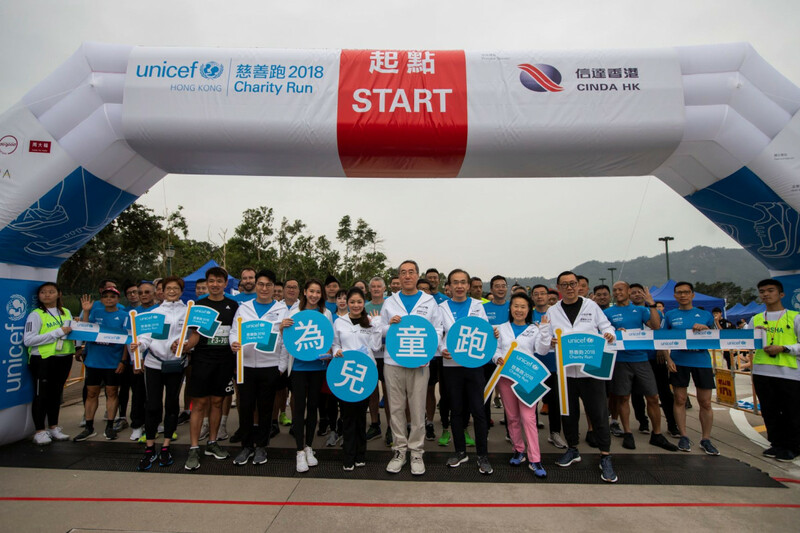 Since the launch of the UNICEF Charity Run in 2006, we have engaged over 130,000 runners from different sectors and raised over HK$130 million to support UNICEF ‘For Every Child, End AIDS’ campaign. 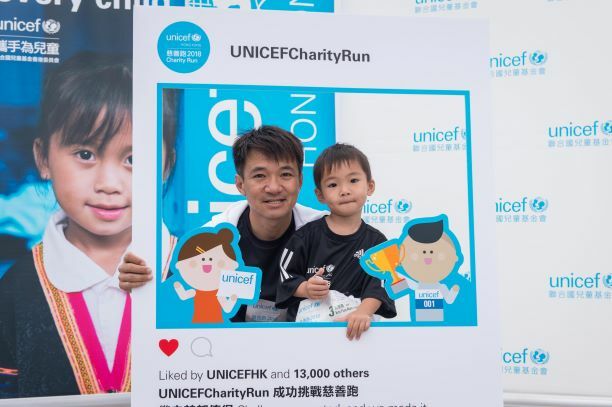 The UNICEF Charity Run 2018 was supported by Principal Sponsor China Cinda (HK) Holdings Company Limited, Diamond Sponsors Chow Tai Fook Jewellery Group Limited and S.F. Express (Hong Kong) Limited, Gold Sponsors Asia Miles Limited, New World Development Company Limited, Venue Sponsor Hong Kong Disneyland Resort and a number of supporting partners. 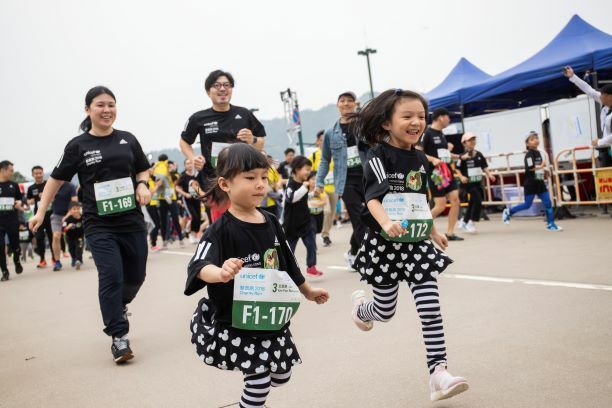 In addition, Official Sportswear adidas Hong Kong Limited also provided with event souvenir T-shirts and training workshops for runners. Official results of all races will be posted in early December on the UNICEF Charity RUN website: run.unicef.org.hk. 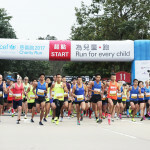 The UNICEF Charity Run is the only charity race in Hong Kong sanctioned by the Association of International Marathons and Distance Races (AIMS). The Half Marathon and 10km routes have also been verified by AIMS and the Hong Kong Amateur Athletic Association (HKAAA).